The promise of Blockchain to disrupt businesses just like the internet did in the 90’s has driven many businesses and corporations to dip into blockchain technology. But how much do you understand about the impact of blockchain on your business and operations? How do you get an unbiased view of blockchain’s potentials and pitfalls? How do you, as a business leader, leapfrog your competition and propel your business into the next evolution? Are you missing out? The BLOCKCHAIN APPLICATIONS & ECONOMICS FORUM 2018 cuts across the hyperbole and brings together business leaders, government, and blockchain enthusiasts alike to access the state of blockchain and discuss applications on improving and changing the way business is done. 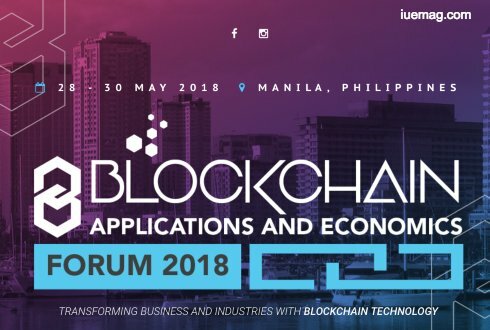 Join us for one of the most engaging blockchain events you will find on 28 – 30 May 2018 in Manila, Phillippines. If you think you would love to be a part of this event email us at contact [at] iuemag.com or comment here for someone to contact you and help you out with this. We look forward to seeing you there.